She was found all alone on a suburban driveway. She was burning from the heat of the sun beating down on her small body, desperate for shade. She was just a baby. Luckily, help arrived. Lucy, as she was named, was taken to the Australia Zoo Wildlife Hospital in Queensland, Australia (founded by the late Crocodile Hunter himself, Steve Irwin). Lucy also suffered from a case of pinkeye, but is now well on her way to making a full recovery. She will then be released back into the wild. Her most recent update shows the koala is not dependent on milk and is well enough to nibble on solids. 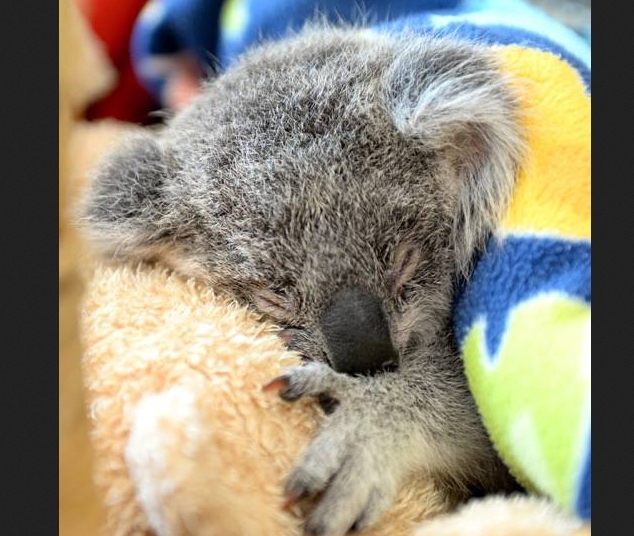 It is unknown how Lucy ended up orphaned on a driveway, but according to the Australian Koala Foundation, approximately 80 percent of original koala habitat has already been destroyed through methods such as deforestation, forcing more and more of them to live alongside humans in urban and suburban areas. Thankfully, this cutie was found just in time and is on a road toward healing filled with love. Happy Australia Day! And to all the Aussies living abroad Lucy the koala joey says G’day from home! 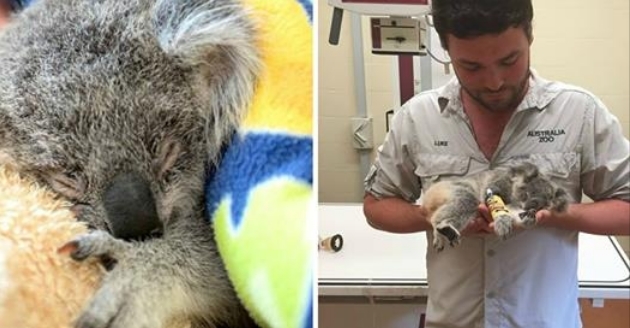 Responses to "Baby Koala Clings To Teddy Bear After Losing Her Mom"
So glad that this little one was saved due to compassionate people. Is there nothing that can be done about this ruthless deforestation? What is the Government thinking about? Can the public not protest the devastation that is destroying these unique species and the environment? Very upsetting! You can find out a lot of great information and how to help from anywhere in the world by visiting the Australian Koala Foundations website. I don't work for them but I am a supporter and sponsor a koala. One of their slogans is "No Trees, No Me" with a picture of a koala. Their website gives all sorts of ways we can help preserve the natural environment for koalas and many other wonderful animals. I don't know if this link will go through but just in case, I'll try.